The term germination designates the overall processes beginning with the imbibition of water by dry seed and ending when a portion of the embryo penetrates the seed coat. This process include cell division, embryo enlargement and increase in metabolic activities. 1. 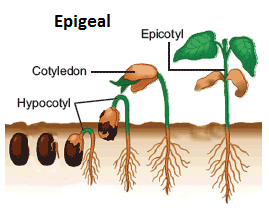 In this type of germination, the seed /cotyledons emerge out of the soil or above the soil. 2. The cotyledons turn green (photosynthetic) and act as first leaves of the plant. 3. There is greater elongation of the hypocotyl. 4.The terminal part of hypocotyl is curved to protect the plumule from the friction of the soil. 1. In this type of germination, the seed/ cotyledons remain inside the soil or below the soil. 2. The cotyledons play no role in photosynthesis. 3. There is greater elongation of the epicotyl. 4. The terminal part of the epicotyl is curved to protect the plumule from friction. You mistakenly reversed the description.
. i like your descriptions, they are authentic.